It's Thursday, Craving Ellie in My Belly day! This week's Ellie Krieger recipe is Sweet & Spicy Grilled Cheese Sandwiches, chosen by Leslie at Lethally Delicious. I typically have an aversion to making sandwiches for dinner. If I'm going to the effort to cook, I want to have more to show for it than "just" a sandwich. Making this dish proved to me that my assumptions have been a bit off; t was hearty, filling, and delicious! I'm going to give sandwiches more of a chance from now on. I served them with creamy tomato soup (recipe coming soon!) and mixed greens with hearts of palm and fresh mozzarella. Thanks to Leslie for a great pick! A note about this photo: The inconsistent quality of my food photos has been on my mind lately, specifically photos like this taken at night in my crappy kitchen lighting. I've been coveting a Lowel Ego light, but I'm on a grad student budget, and too impatient to wait 3 whole months for my birthday. So! We bought a replacement bulb for a fraction of the price, and my Macgyver husband rigged a setup for me. It's perfect for my needs, and I'm extremely pleased with the photo quality (the photo above was my first experiment with the new light). I wanted to share this in case anyone else is in the same situation. It can be done! 1. Heat oil in a nonstick skillet over medium-high heat. Lower heat to medium. Add onions and saute, stirring, until edges are browned, about 10 to 12 minutes. Season with salt and freshly ground black pepper, to taste. 2. Place 3/4-ounce Cheddar on 1 slice bread. 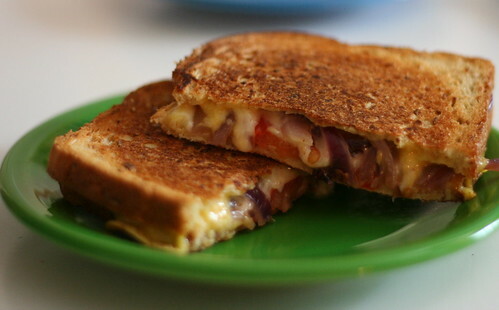 Spread 1 tablespoon caramelized onions on top of cheese and top with 3/4-ounce pepper Jack. Top with 1 large or 2 medium slices tomato and other slice of bread. Repeat with 3 other sandwiches. 3. Spray a nonstick skillet or griddle with cooking spray and heat until hot. Place a sandwich on griddle and weigh down with a heavy skillet or plate. Lower heat to medium-low and grill until underside is a deep brown but not burnt and cheese is partially melted, about 5 to 6 minutes. Flip sandwich and grill other side, an additional 4 to 5 minutes. Slice in half and serve hot. Glad you enjoyed these! I can't wait for that creamy tomato soup recipe! And btw, I think that photo looks great, so don't beat yourself up over it!!! As for the photo..I have more problems than lighting but wish it was that easy to fix. Your photo looks great. oh my god! something i want to comment on. i love grilled cheeses with all my heart and could eat them for every meal if those were the only 2 things left on earth- bread and cheese. Hi Amy! Looks like another great recipe by you. Sorry, I didn't credit the photo, I am so embarrassed!! I am still trying to get a grasp on proper blog etiquette -- will do next time. Your sandwich looks great. I also don;t love them for dinner, mainly because I normally like to eat a hot dinner since my lunch is usually not. Thanks for the link to that light, I really need something like that since I get almost no natural light in my condo. jeez, food blogging is expensive! DUDE! I have to make this sandwich. Grilled Cheese Sammies have a special place in my heart and this one looks like it takes the cake! ...or cheese for that matter. haha! A beautiful sandwich AND a solution to my awful photos taken in my dark kitchen. THAT'S what I call a great post! :-) Thanks for cooking along with me this week! Those look really wonderful. I too don't like sandwiches for dinner...but grilled cheeses are different...special. I love grilled cheese and tomato soup for supper. I'm constantly looking for the perfect tomato soup recipe; looking forward to seeing yours! Whenever I make grilled cheese, I always spread the bread with mustard pickles. It's good, I swear.